You are here: Home » Blog » LinkedIn ‘Who viewed your profile’ – which types of people are most proactive? Over the past few months we’ve been conducting an experiment to see which types of people are most proactive on LinkedIn. Specifically, which people check who has been going to their profile, and then act on it. During that time we’ve visited over 8,000 LinkedIn profiles of people, mainly within the UK. NONE of those visits involved us making a connection request or sending messages – just a visit. Those were all people who, if we tried to reach out in normal circumstances, could feasibly be interested in utilising our A1WebStats product to get more results from their websites/website visitors. 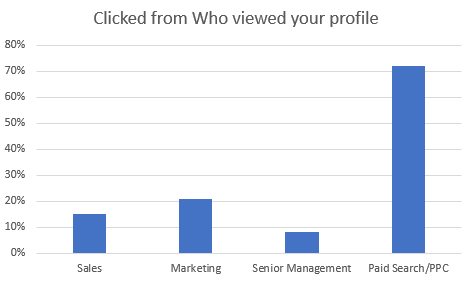 What we were mainly interested in were those people who spent time checking who had been to their LinkedIn page, and who then clicked through to the person who visited them. Sales (purely because sales people should, in theory, be interested in who has visited their profile). Marketing (because marketing people are often inquisitive and looking for opportunities). Chief Executive/Owner/Director (we originally put these in last place, thinking they’d be less active on LinkedIn). Paid search or PPC (this was a bit of a wildcard last minute thought to add in). That was incredibly high and totally unexpected. Remember, we hadn’t asked anyone for connections or left any messages. We’re not sure what this means about people who do paid search/PPC, because although there is a link between those job roles and using our product to get more ROI, that wouldn’t have been obvious from the profiles that visited their pages. Oh dear, this was a disappointment. You’d think that people with ‘sales’ in their job titles would be ongoing on the lookout for opportunities, which can often come from people on LinkedIn. We expected so many more sales type people to be proactively looking at who went to their profiles and then checking them out. Shows how wrong you can be. As originally expected, the numbers of this group investigating further who went to their profile, was very low. Perhaps this is to be expected – these types of people probably get spammed on LinkedIn regularly and so are less likely to spend time checking who has been to their profile. So, not really a surprise. Did all this actually achieve anything? Not really, but it was food for thought. People in Sales & Marketing would normally be those most likely to be interested in what we have to offer, and yet we didn’t see a lot of proactivity. People in owner positions could perhaps be expected to check who has been to their profile, just in case there was anything potentially useful in there. People in paid search/PPC – well, that’s a bit of a mystery to us but they certainly seem to be most proactive (by a long way) in viewing who has been checking them out.